MAHAMOUD ALI YOUSSOUF, Minister for Foreign Affairs and International Cooperation of Djibouti, said developing countries, particularly least developed countries, were hard hit socially by the global economic crisis. Achievement of the Millennium Development Goals in Africa, which had made great effort to achieve them by 2015, was at risk. The fate of least developed countries in Africa must be scrutinized, with a focus on renewing on their production capacity and improving their access to global markets. He called for implementation of the Istanbul Programme of Action for the 2011-2020 period. Any solution to end the global financial crisis must take into account Africa’s need. Sustained commitment was needed to make the Rio+20 commitments a reality. The Horn of Africa had greatly suffered from the impact of climate change, a cycle of chronic drought and flooding and the drop in foreign aid. Djibouti’s Government had created social policies to relieve extreme poverty. He hoped partners would continue to support those efforts through durable approaches that would allow African countries to move from relying on emergency aid to engaging in long-term development. He called for a comprehensive global approach to food security and said the “zero hunger” objectives of the Secretary-General were achievable. He thanked partners for aiding Africa’s efforts to reduce economic disparity between rural and urban populations and to increase farm production. He cited several Djibouti-sponsored projects to exploit arable land in Ethiopia and Sudan, and an irrigation project on the Awash river on the Djibouti-Ethiopian border. Poor access to and shortage of drinking water and sanitation was a big challenge. Djibouti was among the countries that would be at high risk for a water shortage in the next 20 years. Sustainable development must focus on the population’s needs. The Government had made it a high priority to develop the capacity of its citizens, particularly young people and women, and to end gender-based violence and discrimination. He lauded the African Union initiative to ask the Assembly to adopt a resolution calling for greater efforts to end female genital mutilation. His Government had created social policies and programmes to respond to the huge education, health and employment needs of youth. 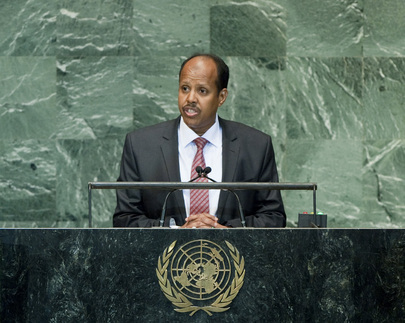 He lauded Somalia’s inclusive, historic elections. As it began a new phase, Somalia would need support from partners, including global financial institutions, to achieve good governance and shore up its economy. He called for stronger and better coordinated action to help Somalia’s Government. The end of the Somali transition process, however, did not mean the completion of the peace process. Political dialogue must continue. Millions of internally displaced Somalis needed humanitarian aid and restoring security would not be easy, given the presence of extremist groups in the country. The international community must guarantee predictable, continued funding for the African Union Mission in Somalia (AMISOM) to aid reconciliation and stabilization. Uganda, Burundi, Ethiopia, Kenya and Djibouti had made noble efforts toward peace, but it was necessary to turn the AMISOM into a United Nations force. The Council must support that. He called for a donor conference to raise funds to aid Somalia’s economic reconstruction. Djibouti’s border conflict with Eritrea, which started when Eritrea launched an aggressive attack on Djibouti in June 2008, had yet to be peacefully resolved through regional or global organizations, he said. Convinced that dialogue was possible, Djibouti had accepted Qatar’s offer to mediate and install troops along the Djibouti-Eritrean border in exchange for Eritrea’s withdrawal from Ras Doumeira and Doumeira Island. Council resolutions 1862, 1907 and 2023 addressed the global community’s concern over the prospect of a new crisis in the Horn of Africa. But, two and one half years after the mediation agreement was signed, Djibouti was still awaiting the border demarcation and return of prisoners of war. Further, global events in recent weeks that occurred after the posting of an anti-Islam video could not leave the world indifferent. Political and religious leaders must form a common front against extremism and fanaticism. He called for condemnation of any discriminatory act against any group based on religion, particularly Muslims. Tolerance was needed more than ever. Finally, the occupation of Palestine was morally reprehensible and unacceptable. The global community had a moral duty to end the Palestinians people’s suffering. Recognizing Palestine as a full fledged State and full United Nations member was a first step.